I'm sitting here with my half-packed suitcase nearby. I can't quite believe it's time to travel with 1,000 Knitters again. The more the series grows, the more surreal the experience feels. I know photographers with more training, more experience, more talent, and more money than I. And yet so many of them have projects that have been stalled or stunted for months or years. So why is this one flying along at such a startling clip? The difference, of course, is all of you. It's your interest and support that power the dynamo. Without you, I'd have a ball of yarn and an empty frame. With all that's happening I never got around to properly thanking Lauren (aka Knitter 0176) and the Windy City Knitting Guild for a splendid Chicago shoot, during which we added more than fifty sitters to the line-up. We also achieved a milestone, though due to a miscalculation I was wrong about when exactly it happened. Ladies and gents, I give you Diane, Knitter 0500, who brought us to the halfway mark. Lauren, who has the patience of three or four especially put-upon saints, managed to get me to a Guild meeting after only nine months of planning. It was wicked cool. I want to go back again as a private citizen so I can just hang out and knit. And then, of course, there was a shoot during the Yarn Market News conference. I owe that opportunity to the magazine's intrepid editor (and conference planner), Karin Strom. Talking to so many folks who who keep us in yarn and needles and roving and wool wash and notions and cute bags and other necessities of life was a treat and an education. And that brings me to this past weekend, and what I was doing while Dolores was inflicting deep mental scars on those poor 4-H kids. After such a night they would have been fully justified in being cranky and overtired, but no. Tim and I dropped by the shop to say hello and chat with the Yarnery's vigorous men's group, and I got a royal welcome. They had cookies! These three guys from the group (Eric, Scott, and Sean) came the next day to have their portraits made. Scott's the one who made the cookies. From scratch. Exceptional chocolate chip cookies. And he showed up for his sitting with more cookies. I like Scott. I wish I lived closer to Scott's oven. The shoot was at Yarnover, a long-running annual day of fiber-related indulgences put on by the Minnesota Knitters' Guild. This is a seriously impressive event, folks. The vendor market was large and varied, although I totally didn't buy anything. Except some yarn. And the classes–oh, the classes. What a list of instructors. I actually got to meet the Rainey Sisters, Joan Schrouder and Lucy Neatby; and I heard Chris Bylsma, Sally Melville and Melissa Leapman were in the house. And those are just the names I know about. All told, 73 absolutely gorgeous knitters for the day. Here's a tiny smattering. There in the center of row three is Lucy Neatby, who announced, "I'm going to put a hole in your scarf," and then did. You can see it clearly in the center of the bottom row, in the portrait of my buddy Robert. Robert was one of the first guy knitters I ever met, back at my first Stitches Midwest. The final knitter of the day was Gerrie (0622). Gerrie was scheduled in the last spot, but her goodie bag–crammed with toothsome fresh-baked treats from the Franklin Street Bakery in Minneapolis–was waiting for me at the shoot first thing in the morning. When I'm walking around Provincetown in a caftan this summer, Gerrie, I'll think of you. who served as my assistant during the shoot. She went above and beyond by running to Home Depot to replace a lightbulb that the airline managed to smash through a cardboard box, a metal protector and five inches of bubble wrap. Mary Lou, you were the perfect companion, especially when Lucy invited us to rummage through her case of samples and we discouraged each other from "accidentally" walking away with certain pieces. 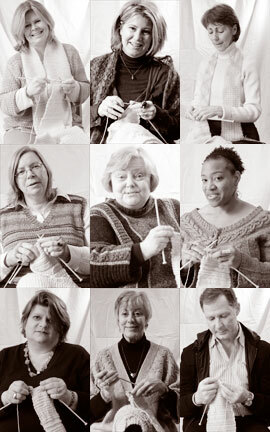 It's neat to see so many knitters' portraits. By the way, you seem to have two knitters in the 0622 spot. I bet the Yarnery writers can come up with something to rhyme with "Franklin". Oops! Thanks tamar - fixed it! Your skin is soft and porous. OK, maybe not so appropriate, but at least it's pretty clean. Man, I'm thinking maybe I should run down to Philly this Saturday after all. At the rate you're going, you're gonna make quota before Austin. Well, I don't know Scott, but Sean is good people and I trust him not to hang with people who aren't also good people. And, of course, the cookies are just icing on the cake, as it were. Apparently 24 hours without sleep causes mixing of metaphors. Among other things. I think your sense of humor and generosity of spirit have also had a lot to do with your project's development of wings. I spotted the hole in your scarf right away. I sure am glad it was on purpose! So ... just wondering ... how long is your scarf at this point? thanks for your wonderful sense of humour! Well, yeah, "whore us" is not family friendly. "Bore us" and "snore us" are family-friendly, but they're not the least bit descriptive of Delores. YAY! I'm so happy I was able to be a part of this fabulous project and have the opportunity to meet you in person--Franklin, you're the best! PS-the last time my pal Paul took the Amtrak to Chicago, he (along with his partner) ended up drinking ALL the vodka on the train. I hate when that happens. LOL! Trust me, those 4H kids could probably give Dolores a run for her money. The best I could come up with for Franklin is a sort of half rhyme: spankin'. I suppose that's not very family friendly either (unless one wants to go with the trite "brand spankin' new"), but it made me giggle! It was great to meet you! Would love to have had time to visit. I agree with Vanessa. The fact that your project is moving along has a lot to do with the fact that it is your project. As for the caftan and P-town, oops, sorry about that. I just didn't think of it. The last time I was there, I won't have noticed if someone's jeans were a bit too tight; the guy walking around with a snake wound around his neck was too distracting. I really don't think you have a thing to worry about, however. The Yarnery crew really packed a lot in. It has been a very knitterly time around here. Harlot, Mr. Habit, Yarnover, MN Knitters Guild meeting and all the workshops offered by shops since all those teachers were in town. Oh, Franklin, those of us in the Antipodes (and, I'm sure, other out-of-the-way places) are sighing in envy as we read about your wonderful project and see all those happy faces knitting away together. 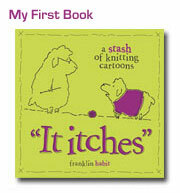 What about expanding this to be a global project- One Million Knitters: The Global Sequel! You MUST come to Austin, even if you have your 1000 knitters by then! ...and there's "3rd Daughter" right above Lucy Neatby! I haven't seen my darling girl since Thanksgiving...Thanks! I detest having my picture taken, but if you wind up within 200 miles of here, I will be standing in line. We were already batting around ideas for your musical tribute last night at Ye Olde Yarnery. Two things, first I'm scared to death I'm not going to one of the 1000. What do you have on the agenda just a handful of Yarnery-type shoots and you'll be done!?! Secondly are my eye's deceiving me and my powers of deductions failing? Wasn't Eric one of the singers and Scott playing the piano? I love how may people in the photos are mid-word or -laugh. I made the blog! I made the blog! I didn't pee my pants though. Thank goodness. Thank you so much for coming and bringing your project to the cities. Know that you are always welcome and I do hope you come back soon. "although I totally didn't buy anything. Except some yarn." 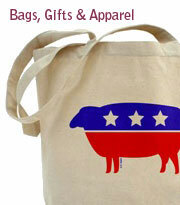 There is absolutely no frickin' way to explain any of "us" fiberish folks to all the fiberless! Maybe our LYS doesn't understand us (quoting your fabulous drawing) but we sure understand each other! Okay, you met Lucy Neatby, so how many degrees of separation does that make between us now? I can't believe you're up to 600+ already. Boy, I'm glad I got in on the 1000 Knitters early. Franklin - if you'd like to come to Seattle to shoot photos, the yarn shops in Western WA are having a LYS Tour the weekend of May 15-18 - 24 shops in all! You could seriously add to your stash. If you're interested, contact Ellen at villageyarnandtea@comcast.net and see www.lystour.com! I am very much looking forward to the photo shoot this weekend! My group has been planning the trip for weeks. Yes, Eric and I were part of the Yarnery Family Singers, as was Angie, also pictured. We all blog, all knit, and all want Franklin to move to Minneapolis where he belongs. And Franklin, whenever you want cookies, just say the word. They'll be on your doorstep moments later. Mel, thanks for vouching for me, and Franklin, thanks once again for being such a charmer. Scott, Eric, and I all had a great time that morning. Be careful what you wish for. The Yarnery Family Singers are a rhymin' bunch. Please come back to MSP soon. Franklin, you are one buff little stud! I wish I could have come up to have my mug included in the 1,000 knitters. I live in Southern Minnesota and couldn't make the drive up. Sounds like you had a fabulous time. Come back soon. We'll treat you to more "Minnesota Nice". GREAT posting, full of lots of info and looks like you are REALLY enjoying this! And the link to the Harlot songfest on You-Tube -- priceless. Must have brought the house down!! Whaddya mean, nothin' rhymes with "Franklin"?! Put your Dolores hat on and THINK! Others with more talent? I scoff at the suggestion. No, really, the difference is not just us; it's you. You've noticed how people will drive across multiple states to meet you and be a part of what you're working on? Those others with more training apparently just aren't as witty, insightful, and all-around fascinating. Now that you're approaching 2/3, it's time to announce what final form(s) the work will take, right? Nothing rhymes with Franklin or Dolores, eh? Heh heh heh heh ... you just wait. I am an avid reader of your blog and spent last night going thru your posts. I am an avid reader and can so appreciate your obsession with getting at the truth of Thomas Mann's writings. I hope I did not open Pandora's Box. hehehe Anyway, thank you for your writings, drawings and spceial inspirations for us knitters! I have added your blog site to my blog so I can share you with my knitty friends. Hope its ok? when are you coming to NYC???? Franklin, your lovely pictures are so full of expression and happiness. They are wonderful! you are amazing. i think i say this every single time i comment hoping that it may ben enough to sway you to travel my way. I BAKE! cookies, and pies, and cakes oh my! unfortunately, all i have to offer is company and a pull out couch. and cats that love guests. and a tortoise, some fish... cute kids. cmon now... whats it gonna take?? i of course, adore you completely. 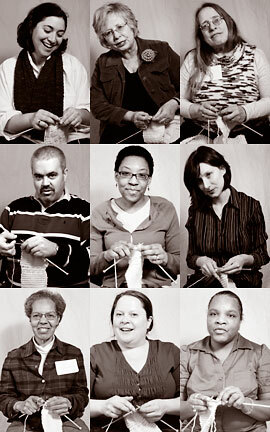 Franklin, will you be coming back to Maine for the 1,000 Knitters project? I missed it in December and I live one town away from Brunswick....darn! I'm so honored to be knitter 0500! I remember having a great time talking to Franklin about going to Meg Swansen's knitting camp last summer. Don't know why I look so serious in the photo. I guess knitting camp is serious business! Thank you Franklin for taking on this amazing project. Though, it will take longer links jewellery but the results will be more long term links of london uk and sustainable.If you are targeting cheap links of london easier as well as less competitive areas you will links london bracelet obtain some high-quality links that will london links charms go on to grow over time. In the long run there is links of london watches sale more steady value from a few solid links coming from discount links of london rings quality sites than having hundreds of low-quality blog links any day. Its a great pleasure reading your post.Its full of information I am looking for and I love to post a comment that "The content of your post is awesome Great work. obat ini murni dari tanaman herbal sehingga tidak menimbulkan efek samping apapun bagi pengggunanya dan bahkan obat herbal kami ini aman dikonsumsi oleh wanita yang sedang hamil maupun ibu menyusui. obat kami telah terbukti khasiatnya telah banyak pasien kami yang sembuh baik yang wasir dalam hingga wasir luar baik yang baru gejala wasir atau ambeien maupun yang telah stadium lanjut bahkan yang pernah operasi wasir pun beralih ke obat ambeienherbal kami ini.kami ini. kami ini. Kondiloma akuminatum ialah vegetasi oleh Human Papiloma Virus tipe tertentu, bertangkai, dan permukaannya berjonjot. Tipe HPV tertentu mempunyai potensi onkogenik yang tinggi, yaitu tipe 16 dan 18. tipe ini merupakan jenis virus yang paling sering dijumpai pada kanker serviks. Sedangkan tipe 6 dan 11 lebih sering dijumpai pada kondiloma akuminatum dan neoplasia intraepitelial serviks derajat ringan. Kondiloma akuminatum ialah vegetasi oleh Human Papiloma Virus tipe tertentu, bertangkai, dan permukaannya berjonjot. Tipe HPV tertentu mempunyai potensi onkogenik yang tinggi, yaitu tipe 16 dan 18. tipe ini merupakan jenis virus yang paling sering dijumpai pada kanker serviks. Sedangkan tipe 6 dan 11 lebih sering dijumpai pada kondiloma akuminatum dan neoplasia intraepitelial serviks derajat ringan. very good article this time I saw a very good article like this. All original content of this blog, both words and images, is held in copyright by F. Habit. Use of any kind, in any medium, for any reason without express, prior written consent is prohibited. Permission is not granted for the posting of any content from this site to Pinterest, Facebook, Twitter, or any other Web site. Please do not provide links to any product, service, organization or cause when leaving comments unless directly related to the topic of the post. Unsolicited advertising will be deleted and repeat offenders will be blocked. When in doubt, please ask. I'm not mean, I'm just committed to preserving the quality of experience for my readers.